I am a flight instructor. 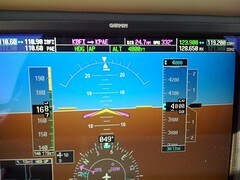 I provide outstanding G1000, instrument, & commercial flight training. My style emphasizes a detailed, practical education that revolves around real world operations. I fly in the greater Seattle area out of Paine Field (KPAE), Boeing Field (KBFI), Renton (KRNT), and Arlington (KAWO). my students are well prepared: over 90% have passed on the first attempt, many under the national average for the rating. My going rate is $60 per hour for flight instruction, up to a maximum of $300 per day for training and delivery or ferry flights. Please note that I do not offer primary instruction unless you own or can provide an insured aircraft. I created these lesson plans while working on my instructor ratings. Most are pretty old: some have been updated since then, some have not, and some are missing and have yet to be reformatted. You can browse the lesson plan category, which sorts these by revision date. This work is licensed under a Creative Commons Attribution-ShareAlike 3.0 Unported License. You’re welcome to use my lesson plans as a basis for your own, but they must also use this license.